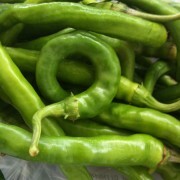 In Japan, this slender, gnarled, dark green, finger sized pepper is known as Shishitogarashi. Around town it is known as just shishito. It is used culinarily as a flavorful but not spicy pepper, though one of ten peppers may have that heat of chili peppers. If left on the plant, the peppers will ripen from green to red. It is thin skinned, lending it a delicate tenderness. – Always wash and dry your peppers well before preparing. – Peppers are often cooked whole stems on. – It is often broiled, grilled, flash-fried, or dry roasted (it blisters nicely and flavorfully). – Skin and seeds are edible. Don’t eat the stems, too fibrous — they are used more as a little handle! Choose peppers that are taut and glossy skinned, there should be no red streaks (overripe). Store in refrigerator up to a week unwashed in bag or container to retain moisture.